The Hubble team had either to figure out how to get this backup gyroscope working, or to turn to a previously developed and tested one-gyroscope mode, which is proven to work. It took weeks of creative thinking, repeated tests, and minor setbacks to solve the problem of the misbehaving gyroscope. Members of the Hubble operations team and of the review board suspected there might be some sort of obstruction in the gyroscope affecting its readings. Attempting to dislodge such a blockage, the team repeatedly tried switching the gyroscope between different operational modes and rotating the spacecraft by large amounts. In response, the extremely high rotation rates from the gyroscope gradually fell until they were close to normal. Encouraged but cautious, the team uploaded new software safeguards to Hubble to protect the telescope in case the gyroscope should again report unduly high rates, and then sent the telescope through some practice manoeuvres to simulate real science observations. They kept a close watch to make sure everything on the spacecraft performed correctly. It did. In the early morning of 27 October Hubble captured its first image since slipping into safe mode at the beginning of the month. The observations targeted star-forming galaxies 11 billion light-years away in the constellation Pegasus. 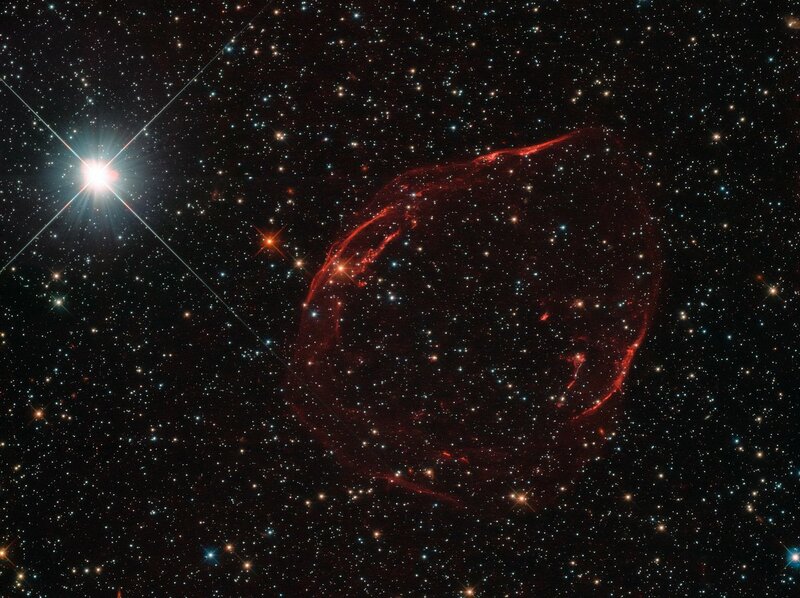 Astronomers hope to use observations like this to answer the question of how the Universe was reionised between 150 million and one billion years after the Big Bang. This picture has been taken with a nikon 300mm f2.8 and a DSLR. 1 hour exposition time total. My first contribution. I did the inversion of the image to show the nucleus. 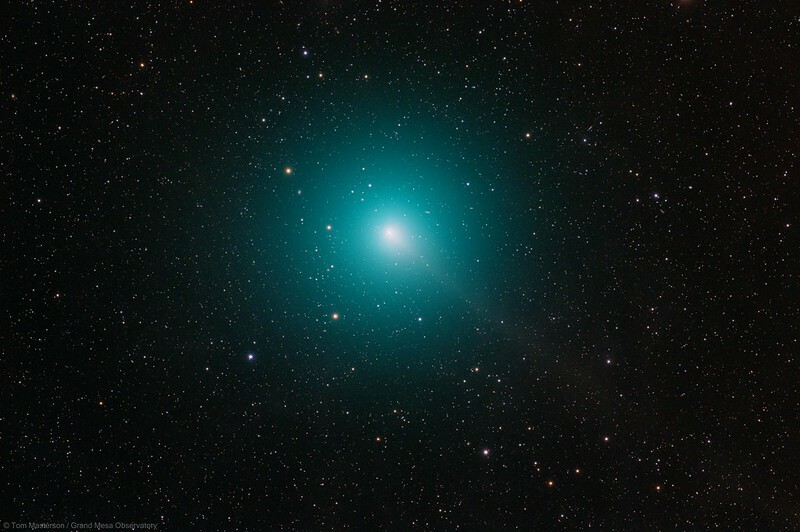 The nucleus is the central and solid part of a comet. 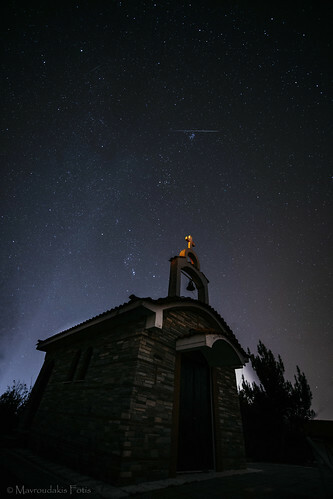 A cometary nucleus is composed of rocks, dust, and frozen gases. When warmed by the sun, the gases sublimate and produce an atmosphere surrounding the nucleus known as a coma. 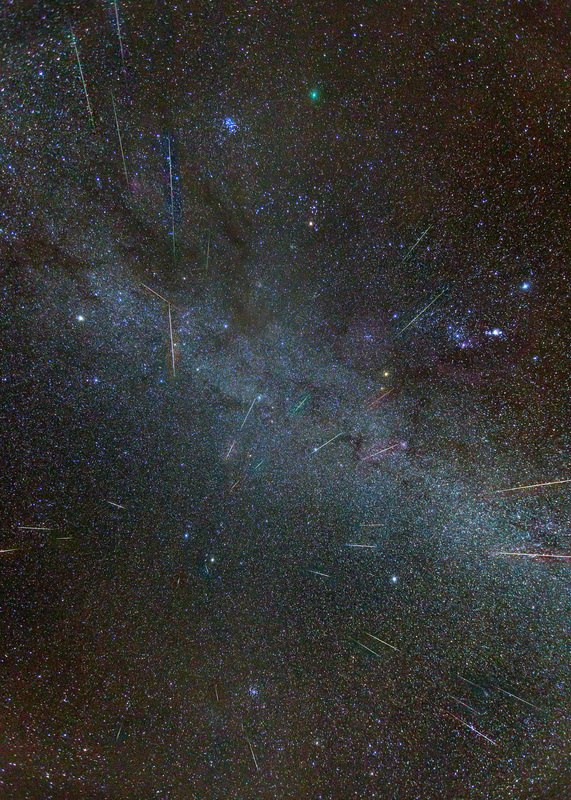 This is a small part of a large picture showing Comet Wirtanen among Geminid meteors. See the glorious full size image here. 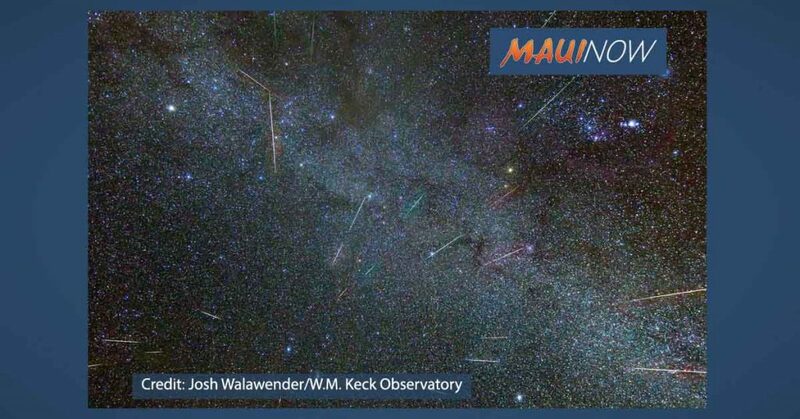 And note the multi-colored meteor trails. EDIT: The full size image, 11.44 MB, is here. 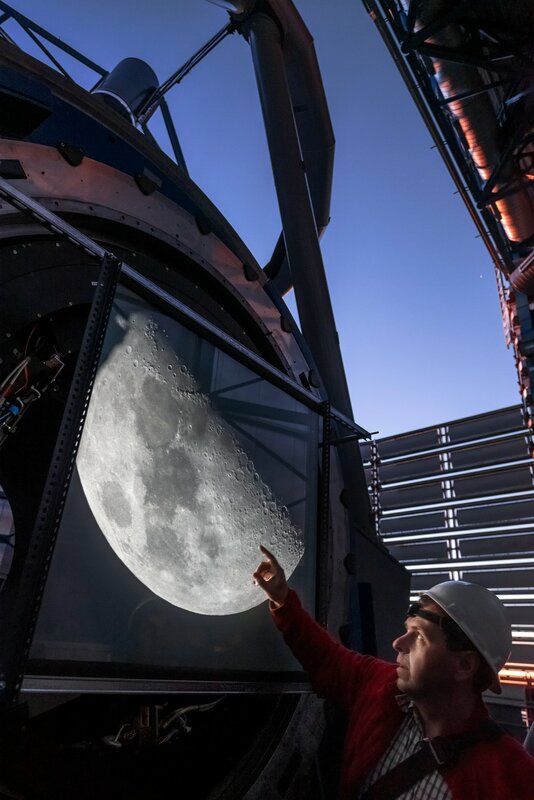 Few people have ever viewed the Moon through a telescope as monumental as ESO’s Very Large Telescope (VLT). Astronomers at Paranal Observatory in Chile recently enjoyed this unique opportunity when one of the telescope’s instruments, VIMOS (VIsible Multi-Object Spectrograph), was decommissioned to free up a space at the UT3 telescope for the upcoming CRIRES+ (the CRyogenic InfraRed Echelle Spectrograph Upgrade Project). 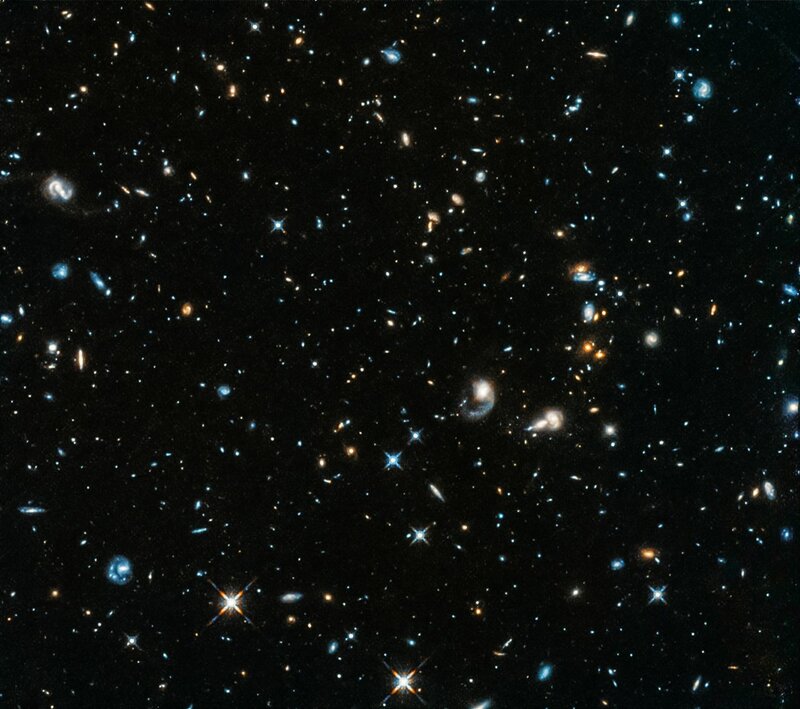 VIMOS was astonishingly productive; the spectrograph studied thousands of distant galaxies seen at a time when the Universe was only at a third of its current age, and mapped their distribution and physical properties. The sensitive instruments used by the VLT, including VIMOS, are designed to image dim objects billions of light-years away, and therefore objects as near and bright as our planet’s moon easily completely saturate them with far too much light. But when VIMOS was decommissioned after 16 years of service, the astronomers stationed at Paranal took advantage of the unusual opportunity to utilise a telescope focal station with no instrument attached. Instead of looking into deep space, they pointed and focused UT3, one of the VLT’s Unit Telescopes — the VLT has four, each with a mirror measuring 8.2 metres across — on the Moon. To create this mesmerising image, the twilight Moon was projected onto a semi-transparent screen, resulting in an intricately detailed display of the myriad crags and craters scattered across its surface. This incredible view was enjoyed by numerous astronomers including Stefan Ströbele, the Adaptive Optics engineer seen in this image. How interesting! 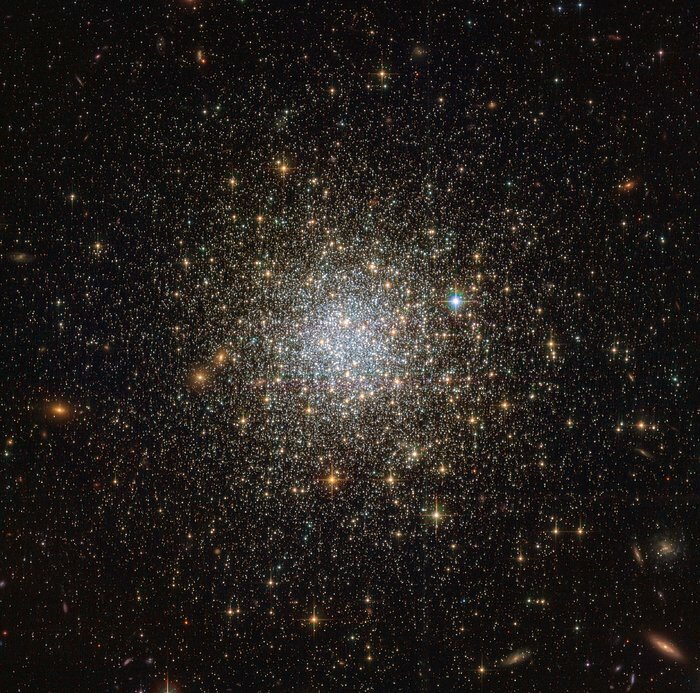 NGC 1466 is extremely ancient and presumably very metal-poor, and it is indeed sufficiently metal-poor to host RR Lyrae variables. More metal-rich globulars, like 47 Tuc, lack RR Lyrae variables. But no blue horizontal branch stars can be spotted in the ESA/Hubble picture of NGC 1466! In RR Lyrae-rich globulars, the blue horizontal branch stars usually stand out very clearly. They are the "second brightest" kind of stars in most globulars, a lot fainter than the red giants, but clearly brighter than the main sequence stars. Their color also stands out in good color photographs. How can it be that NGC 1466 lacks blue horizontal branch stars? Oh. Wait. Maybe it doesn't. When I scrutinized a large version of the picture of NGC 1466, I did indeed spot numerous pale green stars that appear pretty bright. They are the blue horizontal stars? 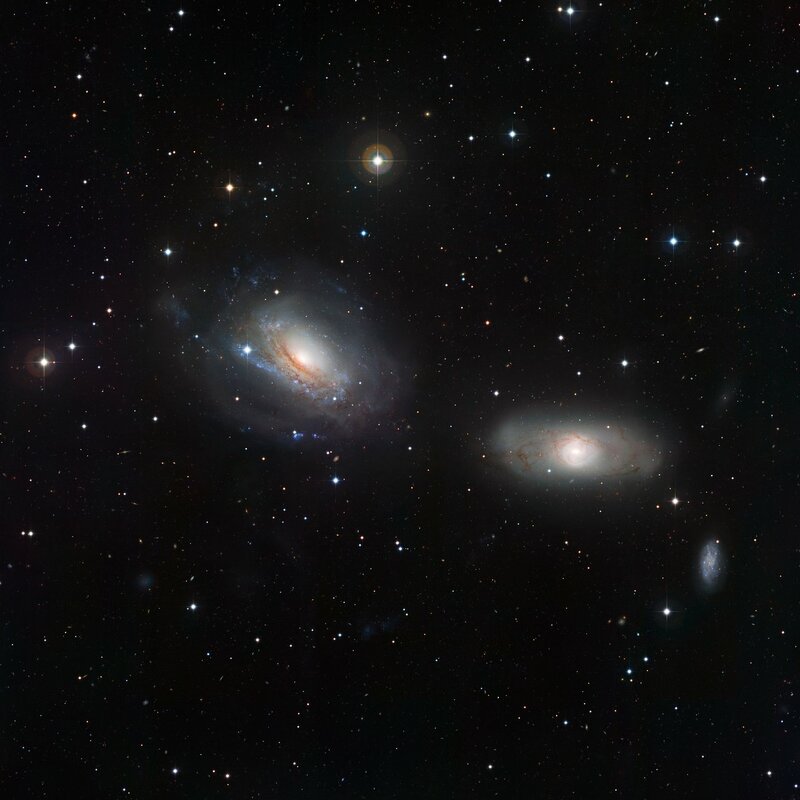 Most of the stars of the crowded inner part of NGC 1466, by contrast, look quite blue-white. What filters were used for this image?